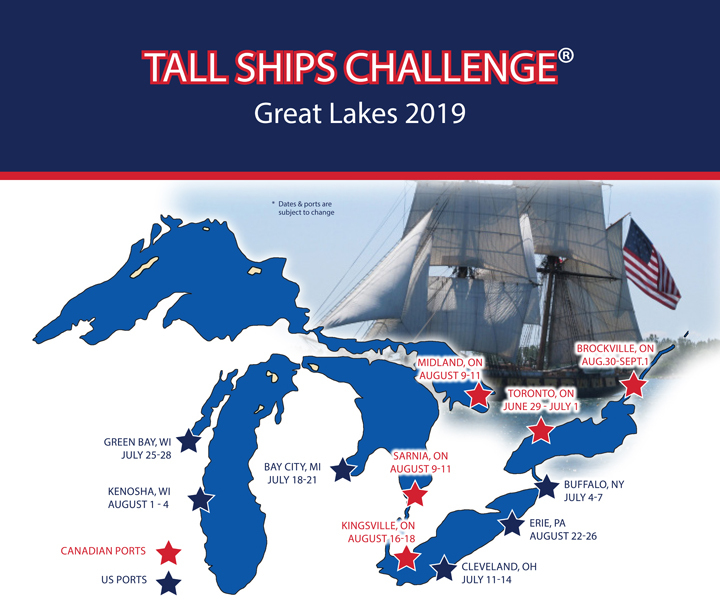 This entry was posted on September 11, 2018 at 11:38 am	and is filed under 2019, Cleveland, OH, Great Lakes, Green Bay, WI, Tall Ships America general, Toronto. You can follow any responses to this entry through the RSS 2.0 feed. You can leave a response, or trackback from your own site. What about Chicago and Duluth, Mn? Unfortunately, we are not returning to those cities in 2019 but hope to include them in future years. As a response and interest to this I have posted the Cleveland port and Cleveland arrival as an event page. For whatever reason this event posting has gone “viral” and I have approaching 9,000 people interested and attending connected to that event post in 2 days!! For our part we plan on sailing in the Cleveland vacinity and harbor with our trimaran sailboat. I have many peoiple asking questions about what ships are attending and what vendors may be there ect. Please feel free to share any information on this facebook event page as it seems to be getting allot of attention.